Caron Farnesiana defies conventions with its interpretation of violet and almond tinged mimosa notes. The classical softness of mimosa is rendered as suave and tender, yet the effect is more like delicate swirls of incense smoke rather than the swan dawn lightness of spring flowers. Farnesiana has an elegant, mellifluous character, yet at times it speaks in sultry whispers, with the overall impression of the fragrance being surprising, dramatic and at times unpredictable. The brooding glamor of early Caron fragrances was the signature of the house’s founder, Ernest Daltroff, who between 1904 and 1941 created almost 40 different fragrances for the collection. After the beautiful reign of Ernest Daltroff ended with his death in 1941, Michel Morsetti took over the creative direction. Farnesiana was born in 1947, as a double reference to the Mediterranean that has always inspired Daltroff: the plush beauty of Acacia Farnesiana, the Latin name for cassie flowers and the High Renaissance splendor of the Palazzo Farnese in Rome. The warm and powdery fragrance of cassie flowers has an interesting undertone of balsamic spiciness, which is fully explored in Farnesiana. The composition hits the sonorous, dark notes immediately, giving a glimpse of its incense and sandalwood inlaid base. The honeyed sweetness of mimosa is rendered as the luscious richness of almond nougat, which when paired with the dark woody and ambery notes makes for an exciting counterpoint to the plush floral notes. Initially Farnesiana has a luminous quality, augmented by orange blossom and jasmine; as it dries down, the incense and musk give it a more somber and seductive hue. The closest modern equivalent to Farnesiana is Frédéric Malle Une Fleur de Cassie, which in contrast to most mimosa focused compositions also explored the dark and brooding aspect of this fascinating spring flower. The most recent version of Farnesiana I have smelled struck me as very good. The main difference is the stronger vanilla note and the clearer, brighter floral accent which serve to give Farnesiana a more baroque aura. While I will not pretend that Farnesiana is a crowd pleaser—the combination of powdery warmth and incense richness can be challenging at times — it has a striking beauty. It is a memorable fragrance in the best of the grand parfum tradition. Caron Farnesiana includes notes of cassie, mimosa, bergamot, jasmine, violet, lily of the valley, lilac, opoponax, vanilla, sandalwood, hay, and musk. It is available from Bergdorf Goodman and other major retailers. A list of stores can be found at Parfums Caron website. Sample source: vintage 1950s bottle of Farnesiana parfum, 1990s Farnesiana parfum and the most recent parfum version sampled at Bergdorf Goodman. 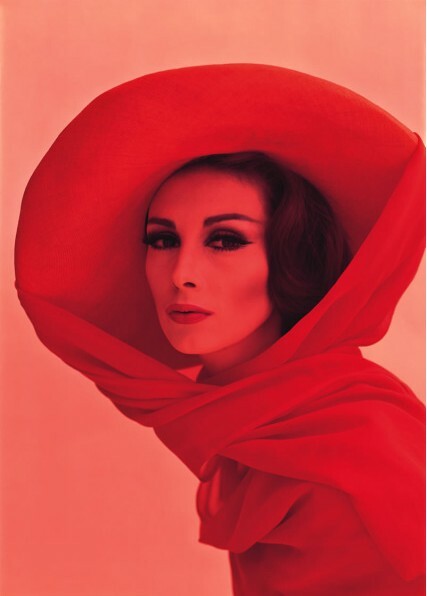 Photo credit: Wilhelmina, Paris 1967, by F.C. Gundlach, some rights reserved. Tracy Bloom, LMT: As soon as I saw the Red Lady I thought, is this what Victoria looks like? Somehow this is how I picture you – gliding down Parisienne Blvds. tho wearing shades of course, and a whisper of fragrance as she passes by – what is it? Where has she been? With whom? And for what type of liaison? Kate: Victoria looks more like Audrey Hepburn. Suzanna: One of my favorites, so what a pleasure to find a review of it today! Victoria: I am so happy to see another Farnesiana fan. It is probably one of the least known from Caron, and yet it is a fantastic fragrance. Notturno7: I’m wearing Farnesiana today and I love it. The weather turned a bit cold for California standards 😉, after few summery days, so Farnesiana hits the spot. It feels really luxurious, rich and kind of soothing!! I got a vintage EdP on Ebay (little dots on the oval shaped bottle ). I might even check pure perfume if I make it to Barneys, I hope they carry it.